Raymond Bernard Felton, Jr. was born on 26 June 1984, in Marion, South Carolina USA, and is a professional basketball player, best known for playing in the National Basketball Association (NBA) for the Los Angeles Clippers. He’s also played for other teams including the New York Knicks and the Portland Trail Blazers. All of his efforts have helped put his net worth to where it is today. 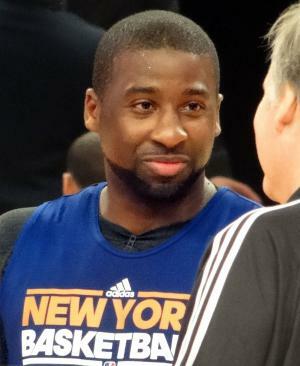 How rich is Raymond Felton? As of early-2017, sources inform us of a net worth that is at $15 million, mostly earned through success in professional basketball. He plays as a point guard, and initially rose to prominence as part of the University of North Carolina’s team during his college years. As he continues his career it is expected that his wealth will increase. Raymond attended Latta High School, and during his time there helped the school win two state championships. He had a record of 104-9 there in the games he played, and also set a state scoring records with 2,992 points. He was named Naismith Prep Player of the Year in 2002, and was voted as MVP in the 2002 Roundball Classic. Before moving to his college career, he was considered a five star recruit and the number one point guard prospect in the country. After matriculating, he attended the University of North Carolina and would make an impact during his freshmen year. He became a Bob Cousy award finalist during his second year and set a school record of 18 assists in a single game. In his third season, he helped the Tar Hills win the 2005 National Championship, which would help earn him the Bob Cousy Award and he was also put on the cover of the video game “NCAA March Madness 06”. Felton joined the 2005 NBA draft, and was selected as the fifth overall pick by the Charlotte Bobcats. He scored and generally performed well during his rookie year, which led to selection in the NBA All-Rookie Second Team. He became a starter point guard during his first year and would continue improving over the next two years. However, the Bobcats were in the midst of rebuilding their team, and Felton struggled to shoot at the three point range. When the Bobcats drafted DJ Augustin in 2008, Raymond’s statistics started to drop and he eventually became a free agent the following year. He signed for one more season, and the Bobcats would make it to the playoffs for the first time before being defeated in the first round. In 2010, Raymond signed a two year $15.8 million deal with the New York Knicks, which helped increase his net worth significantly. He helped lead the Knicks to the playoffs, however, he was traded to the Denver Nuggets the following year. During his time with the Nuggets, he was only utilized as a backup point guard though he performed well. However, wasn’t satisfied with playing off the bench, and so he was traded to the Portland Trail Blazers. He struggled with the Blazers and didn’t get along with head coach Nate McMillan, so after a season he returned to New York in a trade, and was given a three year $10 million contract extension which continued to increase his net worth. He improved his play from the previous season, though he had an injury that sidelined him for several weeks. In 2014, he was traded to the Dallas Mavericks and would record a triple double in his final season with them. He was then traded to the Los Angeles Clippers in 2016. For his personal life, it is known that Raymond was married to Ariane from 2012-14. He has had several issues with authorities; in 2014 he was arrested on felony gun charges and pleaded guilty as part of a plea deal, so was given 500 hours of community service and a $5,000 fine. He was also suspended for four games during the start of the 2014-2015 season. Parents Barbara Felton, Raymond Felton, Sr.
1 Professional basketball player with the Charlotte Bobcats (2005-2010), New York Knicks (2010-2011; 2012-present), Denver Nuggets (2011), and Portland Trail Blazers (2011-2012). 2 Selected by the Charlotte Bobcats in the first round of the 2005 NBA Draft (5th selection overall). 3 Played basketball at the University of North Carolina, 2002-2005.